Create a Living and Breathing City From the Ground Up! Put on your construction helmet and start laying out your blueprints. You’re about to put together the biggest city civilization will ever see! 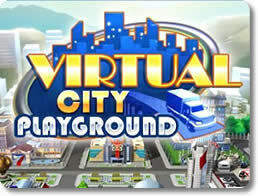 Virtual City Playground gives you everything you will need to get such a place up and running. 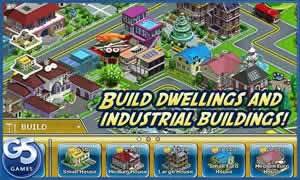 You have a huge plot of fertile land, a load of money in the bank, and all the tools needed to construct buildings, roads and vehicles. However, you have to watch out; there is only so much cash to go around. Plan your moves carefully, keep the cash flow going with a healthy economy, and maintain your citizens’ happiness. Only then will your city be able to grow and thrive! Virtual City Playground could not have a more accurate name. The game will let you go absolutely hog-wild when it comes to designing the look and feel of your city. Everything is yours to command, from the buildings you set up to the layout and branching of the roads. Set up over 150 different buildings, including industrial centers, residential districts, shopping sectors, entertainment facilities and landmarks. Clear out forests and demolish hills to open up new areas for development. Construct roads to connect every building and district to the city. Lay them out in whatever way you see fit. Playing Virtual City Playground will teach you one very important lesson: developing a city can get very expensive. You’ll only have enough money at the beginning to set up a few industrial centers and houses. Don’t expect to get any government handouts when you’re done with all of it. If you want to get a proper city up and running, then you’ll not only have to make every penny count, but you need to generate revenue real quick. Better start establishing a proper chain of production. Build farms and mills to acquire raw materials like oil and crops. Build factories to turn the resources into goods. Make malls and commercial districts to sell the goods for public consumption. Set up routes so that supplies in one facility can be transported to another as efficiently as possible. Earn money for all successful transits. Upgrade facilities to improve their production yield. Produce hundreds of goods, including pies, appliances, clothes and more. In order to have a thriving city, you need people. In order to keep people within your limits, you need to give them some good reasons to stay. Your citizens want to live in an environment that’s clean, safe, comfortable and fun to be in. Be prepared for trouble if you ever find your city lacking in any of those areas. Build houses so that your citizens can have a place to live. Be sure to include all the basic amenities for a safe and healthy community. Build hospitals, fire stations, schools and so on. Keep your virtual community clean by running a garbage pickup service. Improve the aesthetics of your city by planting trees and building cultural monuments. Keep your citizens entertained with parks, theaters, sporting arenas and so on. Improve public morale and support by holding any number of public festivities. Celebrate holidays, hold firework shows, and a launch a shuttle into outer space! With Virtual City Playground, you can enjoy the full city-building experience anytime and anywhere with your favorite mobile device. It has a lot of depth and strategy, lets you get your creative juices flowing, provides endless ways to play, and features colorful graphics that really bring the city you create to life. If the idea of building your own world intrigues you, but you just don’t have enough time to settle in one place for long, then get Virtual City Playground right this instant! It’s the thing city-building mobile gamers have been waiting for.